Getting people to contact you should be the ultimate goal of your website, so it’s important that your contact page sets you up for success. There are lots of people who don’t want to fill out your contact form or they’re interested in something else - like a partnership or collaboration. By not including an easy, direct way to contact you, you’ll likely never hear from them. Use a form on your contact page that collects the information you need from most people. Have a professional email address on your contact page. Include office hours or expected response time. Consider an autoresponder so people hear from you right away about what to expect. Your services page is probably going to be your most content-heavy page because you want to share a lot of information, but you can improve the design by removing distractions (such as a call-to-action in your banner image), breaking up your content into smaller chunks, and making it easy to get in touch with you. A sales page generally focuses on one product or service that is special. Usually you see these for online courses that need to communicate a lot of information before someone purchases. Services page include much of the same information, but are about your general services, even if you have a specific process. You can use a similar layout, but need to include the main ways someone can work with. Gather from skype interviews, emails, Facebook groups, social media, etc. 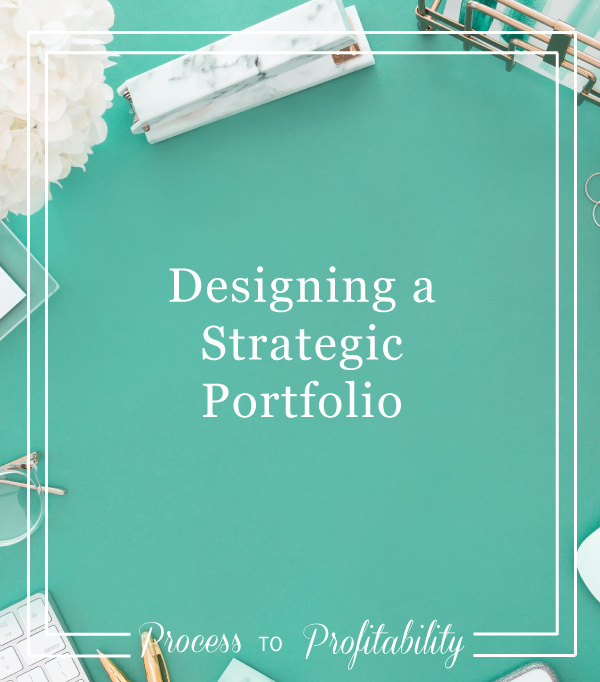 Your portfolio is a great way to show off what you do and connect with your dream client. It’s important that you use this page to show the type of work you want to be known for - not every project needs to be included here. If you have a lot of items to share, consider creating sections based on style or event type so visitors can easily find what they’re looking for. Showcase what you want to be known for. Give potential clients a picture of what you can do for them by addressing their pain points and the transformation previous clients experienced. Include a testimonial from your client about their experience and results. Your about page isn’t really about you, it’s about your dream client. People are going to check you out before they decide to invest time or money into your business. They want to know what you can do for them right now. If you have an online business, whether you’re supporting it through a blog or not, your need a solid About Page that’s easy to find and targeted to your ideal client. This is the second episode in the Designing a Strategic Website Series and today we’re talking about designing a strategic home page. I’m sharing how design home pages that get visitors to take the next step on your website. Your home page is the most important page of your website because it will be the first impression most people have of you. The goal of your home page is to communicate who you are, what you do, where a visitor should start on your website, and to inspire them to action. Make their decision about what to do next easy and get them into your content ASAP. This is a great place to include an appealing opt-in. Visitors to your website should be able to tell what you do within seconds of landing on your home page. Who You Are: let visitors know they can trust you by including a head shot and a sentence or two about who you are and your mission as a business. What You Do: Share the services you offer early so that visitors know what they can hire you for. Include images, calls-to-action for services or products, and a sentence explaining the heart behind your brand. Who you Serve: Be clear about the types of clients you work with using titles they use. Your Big Goal: Encourage action by making it clear what the first and most important action a visitor can take one your #1 goal. You should also have a fallback call-to-action for people who aren't ready for or who have already acted on your big goal.Sending people to your blog is a great option so they see your authority and build trust with you. Instead of overwhelming visitors with every option available, simplify their choices so they can walk through the website step-by-step and gather all the information they need to hire you. Send people to the most valuable places first so they can take action right away. Today you’re listening to the very first bonus episode in the Designing a Strategic Website series. Today we’re talking about designing a strategic navigation. I discuss choosing the right links for your main navigation, strategically leading visitors through your website, designing a footer that keeps people on your website longer, and use for a sidebar and what you should include and leave out. Tune in for the next six weeks to learn more about designing a strategic website – we’re going to cover a different component or page of your website each week. The main menu of your website (the one at the top) is the first thing people will see when they visit your website and it's important that you design it strategically to support your business. When thinking about what to include here, limit the number of links in your main navigation to 7. If you can use less than 7, that's awesome, but don't use anymore as it will confuse visitors and be overwhelming. Use standard language or keywords (like home, about, blog) so people know what to expect when they click a link. If you do want to use more branded language, make sure that it's clear what page a visitor will be taken to when they click the link - no surprises. Avoid drop down menus when possible. They aren't good for SEO (because search engines can't read something that's hidden on a page) and visitors may skip important pages as they're quickly hovering over items without paying attention to what's in the drop down menu. If you need a drop down menu, make it large so visitors take time to look at the options and make sure the top item goes to a page when clicked (instead of not doing anything). When you think about laying out your navigation items, order them in the way someone moves through your website (usually home > about > services > blog > contact) and keep it simple with short words. Because so many people are visiting websites on their mobile devices, you need to make sure that your navigation is optimized for mobile. The industry standard is to use a hamburger menu (three horizontal lines in an upper corner of the screen) that opens to reveal the menu options. If you're using Squarespace, this the pre-designed layout, but there are still design tweaks you can make. For other platforms, you may need to add one or make sure it's part of your template. How people move through your website will impact whether or not they ultimately take action. Your goal when designing your website is to create a journey that gives them all the information they need to take the next step (without throwing everything at them all at once). The best way to do this is to map out how visitors move from landing on your website for the first time to actually buying a a product, signing up for your email list, or getting in touch with you. Once you know where they need to go, create a call-to-action at the end of each page or blog post to direct visitors to the next step. Today I’m going to be talking about what pages you need on your website. The reason I wanted to talk about this today is because every Tuesday for the next few weeks, I’m going to release a bonus episode specifically about some of the most important pages on your website. I’m going to talk about trends, what’s working and what isn’t, and what you can do to create a strategic design for each of those pages. We’re going to start today talking about which pages you might need depending on your type of business. I’m going over why choosing the right pages for your website is important, the goal of your website and how it affects those pages, and creating a journey to get people to take action. Your website is the one location you control - and it’s the first impression most people will have of your business. Your website design should reflect your brand’s mission, vision, and style as it connects with your dream clients. When you throw everything you’re interested in, every detail of what you do, or every option someone has on your website, you overwhelm them. They won’t know what you’re best at or where to start. Instead, keep things simple by choosing only the pages you need to have and creating guides or other resources for things that can happen away from your website. Before you start the design process, it's important to have a bigger goal for your website. This goal should support your business goals and will help you design in a way that helps your business grow. These are some of the most popular goals creative small businesses set for their websites. Each will affect the way you design differently. Before you begin designing or updating your website, it’s important that you determine the ultimate goal of your website and create a journey that move visitors from landing on your home page to getting in contact with you or buying from you. Your website isn’t about you – it’s about your dream clients. You need to focus on their pain points, their dreams, and the transformation they get from working with you. Once you know those things, you can lay out the information they need to take action. What steps do your dream clients need to take in order to take action? Working backwards, what is first step someone should take on your website? Choose the action you want visitors to take based on your goals. Create a single call-to-action for each page. Eliminate distractions that take people away from your website. In order to figure out what pages you need on your website make sure you consider the type of business you have. Some pages are needed on every website, while others will be specific to your type of business. Home - Your home page is the most important page of your website because it will be the first impression most people have of you. The goal of your home page is to communicate who you are, what you do, where a visitor should start on your website, and to inspire them to action. Make their decision about what to do next easy and get them into your content ASAP. This is a great place to include an appealing opt-in. About - Your about page isn’t really about you, it’s about your dream client. People are going to check you out before they decide to invest time or money into your business. They want to know what you can do for them right now. If you have an online business, whether you’re supporting it through a blog or not, your need a solid About Page that’s easy to find and targeted to your ideal client. Blog - Your blog is so much more than simply sharing images or talking about your work - it’s where you can start to educate your clients and give them a behind-the-scenes peek into what you do. Contact - Getting people to contact you should be the ultimate goal of your website, so it’s important that your contact page sets you up for success. Services - Your services page is probably going to be your most content-heavy page because you want to share a lot of information, but you can improve the design by removing distractions (such as a call-to-action in your banner image), breaking up your content into smaller chunks, and making it easy to get in touch with you. Products – If you sell multiple products, you should have a page where visitors can easily find them all in one place. This page should be organized by category, such as topic, type of offer, or who the product is for. Highlight the benefits customers will receive. Testimonials – This is where you house your testimonials, press, or featured posts. You can also show any awards or accolades you’ve received that are relevant to your field. These can be on a separate page, but should also be sprinkled throughout your website. Sales Page (optional) – If you choose to, you can have a separate sales page for each of your services or higher priced products (like courses). This takes the place of your Product and testimonials pages since they will both be included here. Portfolio - Your portfolio is a great way to show off what you do and connect with your dream client. It’s important that you use this page to show the type of work you want to be known for - not every project needs to be included here. If you have a lot of items to share, consider creating sections based on style or event type so visitors can easily find what they’re looking for. Collections – If you sell multiple products, you should have pages where visitors can easily find them by type. You need to organize this in a way that makes sense for your visitors and makes it easy for them to buy. Products – For ease of shopping and SEO, you need a separate page for each product you sell. This is where visitors can learn more about the product, looks at the available options, read reviews, and see any tips for use. Policies – This is different from your website policies, as these will tell customers what to expect once they purchase. You should include information about returns, exchanges, shipping, delivery times and other important information. FAQs – Address any concerns that possible customers may have that prevent them from purchasing. By having a page dedicated to this, you can save yourself time answering questions and make them feel more comfortable that you are an expert at your product. Menu / Offer – Let people know what to expect before they visit your location. If you sell food, include a current menu. If you sell products, give an overview of the types of items you carry. If you offer services, let people know the value you bring. If you want to list prices on your website, focus on the benefits of your service to prevent price shopping. Location – In addition to your address, you should include information about how to get to your location (maps are great), tips for parking, and hours. Calendar (optional) – If you host events or specials, you can include a calendar that has that information all in one place. Categories – Make it easy for visitors to search the content you’ve created by setting up pages for each category of posts. You should also have a search feature that’s easy to use and looks at the content of a post, not just the title. Social Sharing – Make it easy for visitors to share your posts to social media. This is essential to build traffic and gain authority. You should set up the ability to share from a post to Facebook, Twitter, Pinterest, and email. Thank You page – This is the page that visitors will be directed to after they opt-in for something on your website or submit a form. This is a great place to include a small offer for sale or to collect information about a visitor’s pain points. Short “sales” page for each opt-in – If you have multiple opt-ins, it may be helpful to have a short page for each where you explain what the opt-in is, who it’s for, and the benefits of downloading it. This helps sell your freebie and also makes it easy to share and track where people are joining your email list from. Login screen for membership area – If you have a membership area or password protected page, make sure to design it to fit the rest of your website. 404 page customized to fit your design and dream clients – When a visitor clicks on a page that no longer exists, they are directed to a 404 page. Instead of the generic “we can’t find the page you’re looking for” message, customize the page to include your voice, some popular options visitors might be interested in, and a way to take action towards your goal. Today I’m talking about a topic that I’m really excited about – getting to the heart of your brand. In episode 58, I discussed why the heart of your brand and brand strategy matter when designing a website, and today I wanted to dig into how you can figure out what the heart of your brand is. If you’re wondering why this matters when designing a website, I really believe that brand strategy is what takes your website to the next level and gives you the connection with your dream client. My process is focused on both strategy and design so it’s important that I start off on the right foot by delving deep into the heart of my client’s business. Knowing the heart behind your brand – why you do what you do – can inspire other people to rally around you and take action on what you’re offering. But you can’t design a website that reflects that if you don’t know what it is. This process of getting to the heart of your brand, your mission, and your core values, and even your messaging can help you to define your brand and then focus on bringing your website to life with strong, strategic design. Write down your Why and dig deeper through the Why x 5 method. Find your business values and add them to your website. Discovering the heart of your brand means diving deep into the purpose and passion behind your business, as well as focusing on identifying your dream client, brand voice and more. Knowing what drives you and your business will help you create a website strategy that can help you reach your business goals. You’ll walk away feeling well equipped and confident in your ability to better grasp the heart behind your brand, as well as do business in way that enables you to focus on what truly matters in life. Less stressing about whether your marketing efforts are falling on deaf ears, less time spent worrying about how your website is perceived, and more time spent confidently moving forward with a business and website you’re proud to share! Although it’s easy to think that the most important facet of selling our products or services is our product or service itself, your clients are ultimately attracted to the Why, the heart, behind your work. People don’t buy into What you do, as much as they buy into Why you do it. What would you say is the Why behind your work? This method will help you get even deeper into your brand. It forces you to go below the surface to what’s most important and will help you find things that are unique to help you see the heart behind your brand and you move forward in your business. The more honest you are, the better able you are to create connection with your dream clients through shared values and common experiences. The vision behind your work is what you’re striving to accomplish as a result of the Why that drives you. An intentional vision can create a measurable standard of success, identify your business’s direction as you move forward, inspire action, cultivate a sense of community with your team, honor your brand’s values, and speak to your brand’s strengths. It’s most effective with used to guide choices as your business grows and moves forward. What is it about your Why that keeps you excited, fired up and motivated? What are your brand’s goals? Why do those goals inspire you? At the end of your career, what do you want your business to have stood for? What impact do you hope to leave through your work? When you think about how your work can serve your clients well, how your work can bless your life, or how your work can leave a positive impact, what ideas come to mind? What do you envision when you dream big for your business? Your mission takes your vision and shares how you’re moving forward. It includes action details that allow you to bring your vision to life. What mission does your brand seek to accomplish? How is your brand moving forward to achieve your vision? How is your work different from others in your industry OR how does it add value to your dream client’s life? Your values are actionable concepts that define how your brand will move forward to achieve your mission and vision. They are used to inform how you operate in every piece of your business. Your values should be fundamental, steadfast, and actionable. You need to make sure that the values you chose will drive you in the direction you want to go long term. Which of these values is crucial to the nature of your work, the experience you want to create, or the legacy you want to leave behind? Your differentiators are what make you stand out from other people in your industry. They speak to Who you are, not What you do. If your brand is personal, these will be the things that set you apart. If you’re part of a team, then they will be what each person brings to the table and how those work together to accomplish something greater. What talents or gifts do you have that you’re frequently receiving compliments over? What do you consider to be your biggest strengths? If you could have your dream client associate you with five specific skills, values or talents, what would they be? 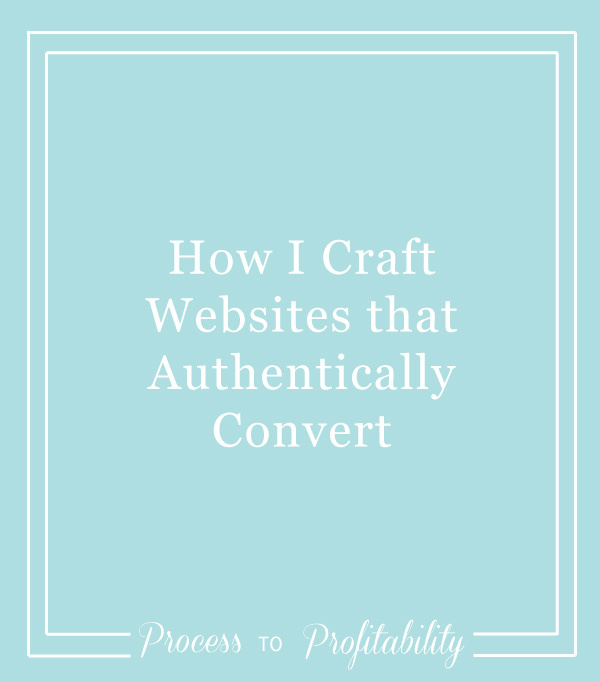 Today I’m going to walk you through how I craft websites that authentically covert for my clients. Over the years, I’ve created a signature process that combines brand development, design, and strategy to craft websites that enable my clients to confidently show off their expertise, charge their worth, and connect with the clients they’ve been dreaming on working with. Your website investment should deliver lasting results, and I’m here to guide you through a process that gets to the heart of your brand so your website can grow with you. If you aren’t sure if your website needs customization or a full redesign, listen to episode 36 of Process to Profitability. If you want a customized report based on your own brand, dream clients, and goals that helps you make the right decisions for your website, sign up for my Website Design & Strategy Audit. If you’re interested in working with me, fill out my website design application. Building an online business gives you the freedom to do what you love while still earning what you’re worth isn’t easy, but it is possible. At Lemon and the Sea, I specialize in strategically crafting websites for the creative small business owner who is passionate about serving her clients and wants to be a part of the design process. I help her stand out as an expert, find more dream clients, increase visibility, and be in control of her website so that she can grow her business and spend more time doing what she loves. I take on a very limited number of new clients each year to ensure that each project gets the time and attention it deserves. I focus on client service and completely custom design. You work directly with me as we craft a website gives you a spotlight on your expertise and is set up to convert and engage with your dream clients. I love working with creative women who have a heart to serve grow their business through bringing all the pieces together into a cohesive website that fits your style and showcases your expertise. My process, which is outlined in this episode, focuses on creating uniquely you design that is designed to be user-friendly and is strategically crafted to support your big goals. And since you don’t have time to look at every revision, I set it up so you know exactly when you need to be involved and when you can focus on your business and let me get to work. I require anyone interested in working with me to complete a short application before I schedule a call to discuss their project. This application helps me to know if the project would be a good fit and that my clients are serious about putting in the work to take their business to the next level. Strategic website design is not only a financial investment, but also a commitment of time – and it’s not for everyone. Having an application helps potential clients understand a little more about how I work and the commitment involved and it gives us a head start when we jump on a call to discuss how we can work together because I already know a little about their business. Because my process is focused on both strategy and design, it’s important that we start off on the right foot by delving deep into the heart of your business. Knowing the heart behind your brand – why you do what you do – can inspire other people to rally around you and take action on what you’re offering. But I can’t design a website that reflects that if I don’t know what it is. This process is an exciting opportunity to hone your brand’s mission, core values, and messaging as we move forward. Then, with the heart of your brand defined, we’ll focus on bringing your website to life with a strong, strategic design. This phase is all about gathering information and making sure your new website will be absolutely unique, completely user-friendly, and strategically designed to showcase your expertise and attract your dream clients. This is the phase that will require the most time from you – the workbooks I’ll give you and creating content takes most people much longer than anticipated, so plan to focus on this during the strategy and design phases. YOU WILL: Complete the next three workbooks as we prepare to design your website. I WILL: Create a Website Vision Guide PDF that outlines your website goals, your dream clients, and the functionality and style of your website. YOU WILL: Review the Website Vision Guide and request any changes. I WILL: Create a Content To-Do List that includes every page of your website and what you’ll need to gather or create. YOU WILL: Review the Content To-Do List to make sure everything makes sense. I WILL: Create a Goal Review PDF that goes over the information gathered from Google Analytics and UX testing so you have a “Before Picture” of your website and we know what to focus on moving forward. At this point, we’ll have a video call to go over the heart of your brand, your website needs, and prepare for the upcoming design. I WILL: Design a Coming Soon page that creates excitement for your upcoming new website. YOU WILL: Review the Coming Soon page and provide any extra information I need to make it live. YOU WILL: Answer the Keyword Planner Questionnaire in your Client Portal so I can optimize your website for SEO and help you show up and get noticed. I WILL: Be working behind the scenes to design mock-ups of the most important pages of your website (usually the home, about, gallery, shop, and blog pages) based on the Website Vision Guide and your inspiration. YOU WILL: Review the mock-ups and request any edits. YOU WILL: Submit your finalized content, including images and copy. At this point, we’ll have a video call to go over the design, any edits you request, and finalize the launch date. During this phase, you can sit back and enjoy a weekly check-in email while focusing on your business. Towards the end of this phase, I will send you a link to the designed and developed website so you can check it out before requesting any final changes. I WILL: Create your design in the platform we chose and develop every part of it supports your goals and attracts your dream clients, as well as insert all of your content including images, copy, forms, products, and downloadables. I WILL: Conduct internal and User Experience testing to make sure everything is working and functions well for your dream clients. YOU WILL: Review the developed website and play around with it to make sure everything functions the way you envisioned. You can also review the test results and request any edits to the website. I WILL: Make any final changes and implement basic SEO on your website. YOU WILL: Give final approval on the design. Once this is given, no more changes will be made to the design except to fix minor issues found in final internal testing (like making sure links work). At this point, we’ll have a video call to go over any final edits and make sure everything is in place for your upcoming launch. Now is when you get to pop the champagne (or La Croix) and celebrate! After weeks of hard work, introspection and heartfelt homework, you’re ready to share your new website with the world. As we near the end of our time together, we’ll get on our Launch Day strategy call to devise the best way to build anticipation and excitement so your big reveal is a smashing success. I WILL: Send you a Website Launch Guide so you know exactly what to expect as your website goes live and launch graphics based on your new design so we can both shout it from the rooftops. I WILL: Do a soft launch and triple-check that everything is working. Then I’ll let you know it’s time to celebrate. YOU WILL: Promote your new website and celebrate! I suggest doing a Facebook live and Instagram story to build the excitement. Once your launch day arrives, sit back and toast to all the fruits of your labor. From here on out, it’s all about building your business from the heart. I WILL: Create an SEO Starter Guide to help you continue to improve your search engine results. I WILL: Track and review the analytics on your new website and send you a report on what’s working and what could be improved to better meet your goals. YOU WILL: Request edits and updates to your website and review them once I have implemented the changes. I WILL: Send you tutorial videos that walk you through how to make updates to your website. You can then handle these yourself, give them to your team, or continue to work with me. YOU WILL: Review the tutorials and choose an On-Going Support package that best fits your needs and budget. At this point, we’ll have a video call to go over the results of your analytics and anything you may have questions on. As we dive into our work together, we’ll put our heads together to clearly define the best brand strategy for your business through our 60-minute design and strategy calls! I require these calls because I’ve found that they are the most efficient way to give feedback and work through strategy instead of emailing back and forth. Each call is structured to review the current phase of the project and make sure that we’re on the same page as we move forward. It’s also a great time to get any team members involved in asking questions or giving insight. These sessions are designed to encourage you to delve deep into the purpose and passion behind your business, as well as focusing on identifying your dream client, brand voice and more. Using your pre-branding workbooks as our starting point, we’ll dive feet first into how we can best back your website with the heart and strategy that will help you reach your business goals. At the end of each project, you’ll walk away feeling well equipped and confident in your ability to better grasp the heart behind your brand, as well as do business in way that enables you to focus on what truly matters in life. Before any project begins, I have my clients complete the first of four workbooks. I base our entire project on both direct communication from you and your workbook responses, so it’s important to have this completed so that we can move forward on schedule. Plus, we’ll be using these valuable resources as a spring board for our design and strategy calls! The questions in these workbooks aren’t easy - they’ll make you think, push you outside of your comfort zone, and require some dedicated time - but in the end, your work here will help me to give you a website that will support your business and grow with you. As you go through the workbooks, I encourage you to find some time when you can really delve into these prompts and give heartfelt, introspective answers. Sit down in an inspiring space with a glass of your favorite beverage and dream big as you put your brand’s core values, goal, and mission down on paper. And if you feel like you’ve already done this work, it never hurts to go over it again - you will always discover something new. Additionally, you’ll be asked to create a Pinterest board of inspiration after you complete your workbook. This board can be made up of your brand materials, design elements, and websites that inspire you and capture the aesthetic of the overall brand you’re trying to create. Strong brands operate from a place of Why, and have a clear grasp of the values, goals and mission at the core of their work. Operating from a place of purpose in your business changes everything! Having a clear understanding of your dream client will enable every touch point of your business to be succinct and effective - especially in the website we’re crafting. One of the best ways to create consistency and brand recognition throughout your website and other material is through a clearly defined brand voice and message. Now that we’re clear on your Why, your vision, your mission, and your dream client, we’ll dive into the thing we’re here to create - a website that supports your business in all of these things. I offer three different options for website design and strategy so that I can help people in all stages of business. When you’re ready to update your website, you need a design that fits your brand. Website Planning - to help me learn more about your needs and design aesthetic. Concept Design - I’ll design the basic pages of your website for layout and user experience for your approval. Content To-Do List - to help you pull together your site’s content. Website Design - I’ll design all of your website pages using your brand, add all of your content, and help you make it live. Design Review - before the website is finalized, I’ll review everything with you and make updates based on your feedback. Website Testing - the final website will be reviewed and fully tested for functionality and design. Tutorials & Training - I’ll teach you how to manage your website and provide tutorial videos so you can make updates yourself. When you’re ready to update your online store, you need a website that’s easy to manage and fits your brand. Website Design - I’ll design all of your website pages using your brand, add all of your content, and set up an easy to manage eCommerce shop. Product Creation - I’ll create up to 15 products in Squarespace, including adding images, descriptions, and pricing options, and set them up for purchase. To find success, you just need a few tweaks to really create a website that fits your style and brand. Website Audit & Planning - to review your current website and made recommendations based on my professional expertise and to help me learn more about your needs and design aesthetic. Design Review - before the design is finalized, I’ll review everything with you and make updates based on your feedback. I will provide you with a link to your Client Portal, which will include a basic questionnaire and the first workbook that you’ll need to complete. This should be complete before our start date so we can stay on track for your launch date. All of my websites are built on Squarespace or Showit and hosting packages range from $26 - 40/month, depending on your website needs. We will discuss which option is best for you during our initial meeting. What am I - the client - responsible for? This engagement is a commitment in both time and money. I’m crafting your website and want you to be a part of that. As the client you will be responsible for meeting a number of deadlines to ensure that we can give you the most value during our time together. These deadlines are for things such as getting us information about your business to get us started, sending feedback and approving design, and answering questions along the way. The hardest part for my clients is writing and delivering content for your website. Though I will assist you by planning out what content you need and creating a Content To-Do list to help you execute, you will need to have your content delivered, proofread and ready to publish in order to launch your website. How often will I hear from Lemon and the Sea? I pride myself on being very hands-on with my clients. I will manage your project in your Client Portal. During the duration of your project, you’ll hear from me weekly, whether I’m sending over designs, filling you in on the next deliverable dates, or answering any questions you may have. I’m also available for strategy and review calls at set times throughout the process so that you never feel like you have to figure out how to communicate your thoughts through email. You’ll never have to worry about me going missing and I’ll expect to hear from you too. How if I can’t get everything done in time? If you are struggling to meet your deadlines for content or reviewing designs, please let me know ASAP. We can then decide whether to pause the project or set up an intensive day to get work done together.